An outstanding young Braidwood-based cyclist wants to emulate his hero Peter Sagan by one day competing in the sport’s most famous event, the Tour de France, writes Craig Goldthorp. S2 Carluke High School pupil Corey Whiteford – the reigning under-14 Scottish Cyclocross champion – rates his cycling idol as Slovakian ace Peter Sagan, a multiple Tour de France champion. “Corey got a selfie with Peter when he was competing at a recent championships in Glasgow,” his mum Elaine told the Carluke and Lanark Gazette. “Corey hung about in the rain for hours and snuck through the barrier to get a picture. “It is great that such a fine champion like Peter still takes time to meet his fans. A few aren’t as generous with their time. “Peter is down to earth, incredibly cool and does a lot for charity. “Corey would like to be like him by competing in the Tour de France one day – maybe we’ll see it. Corey is bike mad and has been racing competitively in triathlon and cycling since he was 10 years old. The Lanark Triathlon Club member – who is coached by Alan Cardwell – trains regularly by racing up and down the Braidwood braes and takes on adult racers during cycle races of between 30 and 50 miles which are held on Saturday mornings. In addition to winning the Scottish Cyclocross event, Corey also loved competing at January’s British Championships in Kent. His stunning efforts in the saddle were recognised recently when he was named as under-14 prizewinner at the Scottish Cycling Roll of Honour awards ceremony at Stirling Court Hotel. “I’m really proud of Corey,” Elaine added. 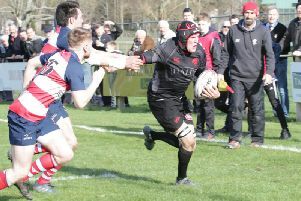 Biggar Rugby Club go up as champions for first time in 34 years! “He trains a lot and works really, really hard. “Occasionally he beats the adults, which they have a good laugh about. “Corey has won a few bits and pieces but this is his first major success on a high level. “He is really delighted. It’s nice he’s been recognised like this by Scottish Cycling. Corey was thrilled to mingle with Scottish cycling legend Katie Archibald MBE – an Olympic Games gold medallist who has also won World, European and Commonwealth crowns – at the ceremony. Corey – whose dad Graham and younger brother Kyle are also into cycling – is looking forward to a busy season.